This Guide will no longer be updated as of June 23, 2017. I haven't played Minecraft in about a year and I have no plans to currently revisit the guide. 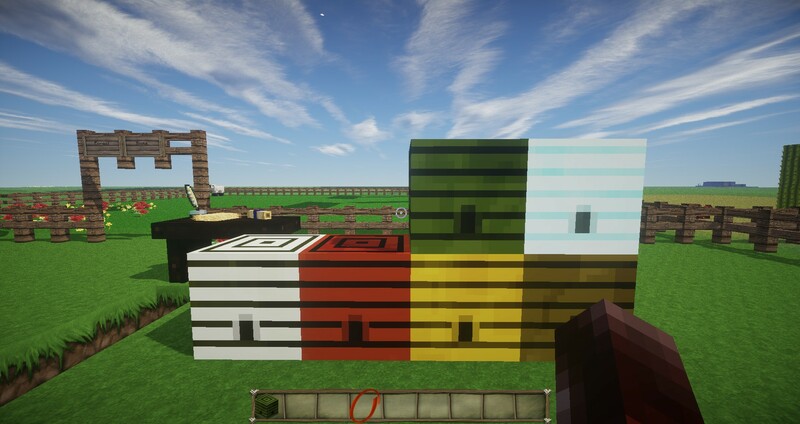 It's been a great run for the many years it's been online and I would like to thank everyone who has contributed and to Sengir for the amazing Forestry Mod. Don't expect another update as it's quite likely I won't do any followups. All the download links for the Bee Quest, if anyone is still interested, will remain up for those to enjoy. The guide will remain as is and I can no longer guarantee it's accuracy. I'd like to thank everyone who has used this guide and posted it in other places and a big shout out to Leaf7 for contributing about 1/4 of this guide, Sengir for allowing this guide to be here AND FOR FORESTRY, Florastar for introducing me to Extra Bees and for telling me that the vindictive branch of bees wasn't released YET(they are now), Binnie for his awesome mod(s) and for being a friend on the forums, Direwolf20 for without him I wouldn't have even tried to make this guide and for introducing me to the world of tech modding. Benitos Lair for making a video that had the guide in it and finally to everyone who has PM me about the guide, everyone who has liked this guide, everyone who has posted the guide somewhere else, everyone who has posted on this guide and everyone who has use it. I have just noticed this and it is not me. If you know of any more things of this PLEASE PM me with the details or comment because it saddens me. Please don't take other people's names or creations as your own. A note to all:Some of the extra bees bees require GregTech, an expansion to Industrial Craft 2. I will put a GT next to the ones that require it. A big thanks to SirSengir for letting me start this topic. DISCLAIMER: If you don't want to have bees spoiled, don't read. Ok, you have to craft a scoop and left click on a beehive and it will drop 1 princess and 1-2 drones with a chance of a Valiant bee. To get started with bees, breed a Mundane Bee with another Mundane Bee to get Common Bees. Then breed a Common bee with a Mundane Bee to get Cultivated Bees. *All of these bees produce regular honey combs. Cultivated bees are the basis for many of the future bee branches. The Heroic Bee is bred with a Valiant bee which is found as a low chance drop from Beehives and a Steadfast bee which is found in dungeon chests. All of these bees produce Cocoa Combs which in turn produce Cocoa beans. The Valiant bee also produces Sugar as a rare (15%) drop. This branch requires to be in a Hell biome (Nether) to get started. To breed a Sinister bee, you have to breed a Modest (Has to be Modest) princess and a Cultivated drone to get it. To get the Fiendish bee, you have to breed a Modest bee and a Sinister Bee. Finally to get a Demonic bee, breed the first 2 bees together (Sinister and Fiendish). All of these bees produce Simmering combs which get you refractory wax and phosphor. Fiendish bees produce ash also and Demonic bees also produce Glowstone Dust. The Industrious branch of bees will get you propolis and Pollen which you need for the Alveary. To get a Diligent bee, you have to combine a Common and Cultivated bees. <Side note>: This same combo will also get you a Noble bee, so if you get Noble instead, that's why. </Side note>. Then if you breed a Diligent bee with a cultivated bee, you will get an Unweary Bee. Then to get Industrious bees which are the ones who produce pollen, breed a Diligent bee with an Unweary bee. *These bees all produce Stringy combs which get you propolis. The Imperial bee will get you Royal Jelly which is needed for making the Alveary too. To get a Noble bee, you have to combine a Common and Cultivated bee. <Side note>: This same combo will also get you a Diligent bee, so if you get Diligent instead, that's why. </Side note>. To then get Majestic bees, breed a Noble and a Cultivated bee. Finally Majestic and Noble bees will get you Imperial. *These bees all produce Dripping combs which give you Honeydew. The Tropical bees needed to start the branch and they are found in Jungle hives. <Side Note> These bees actually sting so wear an Apiarist's Suit </Side Note>. To get the Exotic bee, you have to *I'm not kidding* combine an Austere bee (OMFG) and a Tropical bee. Then to get the Edenic bee, combine Exotic bees and Tropical bees. All these bees produce Silky combs, which then give you silky propolis which then gives you Silk wisps which then can be made into Silk Mesh which then can be made into Apiarist Armor. The Austere branch is REALLY HARD TO GET, You have been warned; you will almost never get the Frugal mutation on the first try. Modest is a Mundane bee found in Desert hives. To get Frugal, you will need to breed a Modest bee with a Sinister or Fiendish bee. <Side Note> 1. This is one of the hardest mutations in the game. 2. Both Sinister and Fiendish are good for different because Fiendish has a higher mutation chance BUT Sinister is recessive so the Infernal branch doesn't dominate the mutation. </Side Note>. Then to get Austere bees, you need to breed Frugal and Modest bees but beware, the Austere bee has some very nasty side-effects like blowing up; you have been warned. All these bees produced Parched combs. The Austere bee also produces Powdery combs which then make Gunpowder. The Rural Bee is a bee that can only be bred in a plains biome (Sengir could correct me if I am wrong) and it requires wheat as its flower so don't forget. It produces wheaty combs which make wheat.It is bred using a Diligent princess and a meadows drone in an apiary. Then if you combine a Rural and Cultivated bee, you get a Farmed bee. Then if you combine Diligent and Rural, you get Growing bees. Then if you combine Growing bees and Rural bees, you get Thriving bees. Finally, if you combine Growing and Thriving bees, you get Blooming bees. To get Wintry bees, the base of this branch, break Wintry Hives in snow biomes. Then Combine a Wintry bee with and Industrious bee to get an Icy bee. Then you combine an Icy bee and a Wintry bee to get an Olaf bee which btw likes warm hugs. Kidding, you get a Glacial bee. All these bees produce Frozen combs and the Glacial bee, as well, produces ice shards. <Side Note> There is an EB Frozen branch which will be under the EB section of the guide. A big thanks to novalover2009 for telling me the combination. The Monastic bee can ONLY be purchased from villagers and not bred. However if you get the Monastic bee, you can combine it with an Austere bee to get Secluded bees. Then if you breed Secluded and Monastic bees, you get Hermitic bees. This line of bees produce Mellow combs. To get End bees, go to the end, Kill the dragon, then harvest the Ender hives to get these bees. Then to get Spectral bees, you need to combine a Hermitic bee and an Ender bee. Then finally Ender bees bred with Spectral bees gets you Phantasmal bees. They produce Mysterious combs and require the Dragon egg as a flower. To get this very dangerous set of bees, you have to combine a Monastic bee with a Demonic bee to get a Vindictive bee. Next if you combine a Monastic or Demonic bee with a Vindictive bee, you get a Vengeful bee. Then if you combine a Vindictive and a Vengeful bee, you get an Avenging bee. These bees are extremely dangerous and should be handled with care. These bees produce Irradiated combs. To get this bee, first you must be within the date range, then breed Meadows and Forest bees together to get a Leporine bee. Then if you combine a Wintry bee and a forest bee, you will get a Merry bee. Then if you combine a Wintry bee with a Meadows bee, you get a Tipsy bee. If you also combine a Sinister bee with a Common bee, you will get a Tricky bee. If you combine an Austere bee with an Excited bee, you get a Celebratory bee <Side Note> From Extra Bees </Side Note>. What they drop is for you to find out Also what they do is a surprise. To get Marshy bees, collect Marshy hives. Then combine Common and Marshy to get Damp bees. Then combine Damp bees and Marshy bees to get Boggy bees. Then combine Boggy and Damp bees to get Fungal bees which produce Mossy and Fungal combs. Most bees require regular flowers, but a certain few bees require different "Flowers" such as Nether Wart, Vines, Cactus, Ferns, etc. *Unconfirmed: I think you have to do this in a desert biome* If you combine a Meadows Bee and a Modest Bee, you get an Arid Bee. If you combine an Arid Bee and a Common Bee, you get a Barren Bee. If you combine a Barren Bee and an Arid Bee, you get a Desolate Bee. If you combine a Barren bee with a Forest bee, you will get a Gnawing bee. If you combine a Gnawing bee with a Common bee, you get a Decomposing bee. They all produce barren combs. The Decomposing bee also produces decomposing combs. Base branch for the other ore bees, these give Cave Dweller, Flyer, and Nocturnal aspect. To get a Rocky bee, find a Rocky hive and break it. To get a Tolerant bee, combine Rocky and Diligent bees. To get a Robust bee, combine a Tolerant bee and a Rocky bee. Then to get Resilient bees, combine Robust and Imperial bees. These bees all produce Rocky combs which don't produce much beeswax. Metallic Branch: To get a Lustered bees, combine Resilient bees with Unweary bees. This makes Nickel and Rocky combs and, well, Nickel combs produce Nickel. Rusty Branch: To get a Rusty bee, combine a Resilient bee with a Meadows bee. To get a Corroded bee, combine a Resilient bee with a Forest bee. To get a Tarnished bee, combine Resilient and Marshy bees. And finally, combine a Resilient bee with an Unweary bee to get Leaden bees. <Side Note> This is the same combo to get Lustered bees.</Side Note>. Each bee produces it's corresponding comb. Rusty: Iron; Corroded: Copper; Tarnished: Tin; Leaden: Lead. They also produce Rocky combs. If you combine A Resilient Princess and a Water Drone, you get a Lapis Bee. It produces Lapis combs which produce Lapis. These produce precious metal. To get Shining bees, breed a Resilient bees with Imperial bees. To get Glittering bee, combine a Corroded bee with an Imperial bee. And to get Valuable bees, combine Glittering and Shining bees. The Shining bees produce Silver bees, Glittering bees produce Gold combs, and Valuable bees produce Platinum combs. These produce gemstones. To get Emerald bees, combine Lapis and Noble bees. Then to get Diamond bees Lapis and Imperial bees. Emerald bees produce Emerald combs and Diamond produce Diamond combs. These are Radioactive, handle with care. To get an Unstable bee, combine and Austere bee with a Rocky bee. To get Nuclear bees, combine Unstable and Rusty bees. To get Radioactive bees, combine Nuclear and Glittering bees. These produce Barren combs and the Radioactive produces Uranium combs. These are Bovine and Caffeinated. To get a Bovine bee, combine Rural and water bees. They produce Milky combs. To get Caffeinated bees, combine Tropical and Rural bees. It produces Coffee combs. These are a basis for other branches. To get an Ancient bee, combine Noble and Diligent bees. Then to get a Primeval bee, combine Ancient and Noble bees. Then to get Prehistoric bees, combine Primeval bees and Majestic bees. Finally to get Relic Bees, combine Prehistoric and Imperial bees. These all produce old combs. To get Fossilized bees, combine Primeval bees and Growing bees (Forest+Diligent). It produces Fossilized combs. To get Resinous bees, combine Primeval bees and Fungal bees. It produces Amber combs. To get Oily bees, combine Primeval bees and Ocean bees. It produces Oily combs. To get a Preserved bee, combine Primeval and Boggy bees. It produces Peat combs. Makes Oil. To get Distilled bees, combine an Oily bee and an Industrious bee. It produces Oily combs. Then to get Refined bees, combine Oily and Distilled bees. It produces Oily and Petroleum combs. Finally combine Refined and Resinous bees to get Elastic bees. It produces Amber and Latex combs. Water bees are found in Watery hives in large bodies of water Ex: Ocean, River, Swamp, etc. To get River bees, combine Water bees and a Common bee. It produces Damp and Clay combs. To get Ocean Bees, combine Water bees and Diligent bees. Then to get Stained bees, combine an Ebony bee and an Ocean bee, you get a Stained bee which produces besides Damp Combs, Ink sacs. Involves sugar. If you combine Valiant bees and Diligent bees, you get Sweetened bees. If you combine Sweetened bees with a Diligent bee, you get a Sugary bee. If you combine a Forest bee with a Sugary bee, you get a Ripening bee. (Also produces Fruity combs as well as Sugar). Finally, if you combine a Ripening bee with a Rural bee, you get a Fruity bee. These bees all produce Sugar as well as the Fruity and Ripening bees producing Fruity combs. Embittered bees are found in Nether hives, have fun finding them :P. If you combine Embittered bees with Sinister bees, you get Furious bees. Then combine a Furious bee with an Embittered bee, you get a Volcanic bee. If you combine a Furious bee and an Excited bee, you get a Glowering bee. These bees produce Simmering combs and the Volcanic bee produces Blaze comb. To get a Viscous bee, combine Water and Exotic bees. If you combine Viscous bees and Exotic bees, you get Glutinous bees. Finally, if you combine a Glutinous bee with a Viscous bee, you get a Sticky bee. These make Ectoplasm and produce Silky combs. Sticky bees produce Mucous combs. To get a Malicious bee, combine a Sinister bee with a Tropical bee. Then combine a Malicious bee with a Tropical bee to get an Infectious bee. Finally, combine an Infectious and Malicious bee to get a Virulent bee. All these bees produce Silky combs and the Virulent bee produces Venomous combs as well. To get a Corrosive bee, combine Virulent and Sticky bees. Then combine Corrosive bees and Fiendish bees to get Caustic bees. Finally combine Caustic and Corrosive bees to get Acidic bees. They produce Silky combs and the Acidic bee produces Brimstone combs. If you combine a Cultivated bee with a Valiant bee, you get an Excited bee. Then if you combine an Excited bee with a Valiant bee, you get an Energetic bee. <Side Note> These bees cause Lightning strikes around the Apiary/Alveary/Bee_Hive; DO NOT BREED IN WOODEN HOUSES. </Side Note> These bees produce Energetic Bees. If you combine Tolerant and Sinister bees, you get a Shadowed bee. If you combine a Shadowed bee and an Embittered bee, you get a Darkened bee. If you combine a Darkened bee and a Shadowed bee, you get an Abyssal bee. These bees produce Shadowed combs. The branch is pretty much Mundane bee + Valiant bee = Primary bee. Forest + Valiant = Maroon; Meadows + Valiant = Saffron; Tropical + Valiant = Natural; Wintry + Valiant = Bleached; Water + Valiant = Prussian; Marshy + Valiant = Sepia; Rocky + Valiant = Ebony. All produce Tinted combs of their corresponding dye. Now putting the colors together. Maroon + Saffron = Amber; Maroon + Prussian = Indigo; Ebony + Bleached = Slate; Prussian + Natural = Turquoise; Prussian + Bleached = Azure; Maroon + Bleached = Lavender; Natural + Bleached = Lime. All produce Tinted combs of their corresponding dye. More color combos. Lavender + Indigo = Fuchsia; Slate + Bleached = Ashen. All produce Tinted combs of their corresponding dye. If you combine an Ender bee with a Relic bee, you will get a Jaded bee. It produces Honey Comb, Pollen, and Purple-tinted comb. 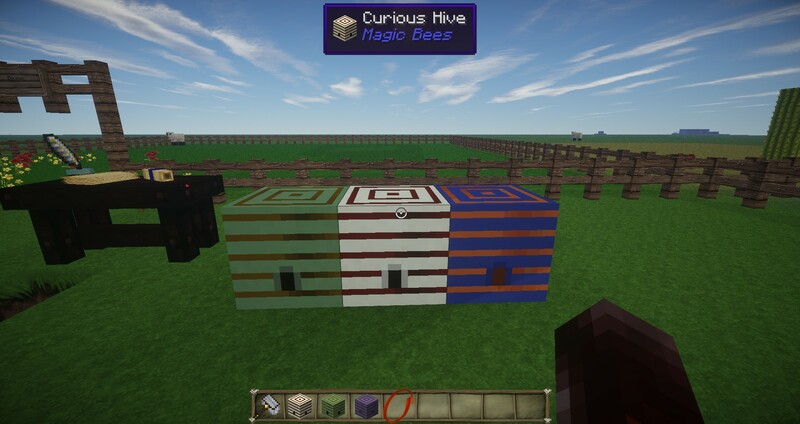 To get an Abnormal bee, combine a Secluded and an Ender bee. If you combine an Abnormal bee and a Hermitic bee, you get a Spatial bee. If you combine a Spatial bee and a Spectral bee, you get a Quantum bee. These bees produce Shimmering and Certus combs. If you combine a Wintry bee with a Diligent bee, you get a Frigid bee. If you combine a Frigid bee with an Ocean bee, you get an Absolute bee. These bees produce Frozen combs and the Absolute bees produce Glacial combs too. These are the bees in Agrarian skies that give you dye. To get a Red bee, combine a Common and a Diligent bee. To get a White bee, combine Wintry and Diligent bees. To get Brown bees, combine a Tropical and Diligent bee. To get a Yellow bee, combine a Modest and Diligent bee. To get Blue bees, combine a Forest and a Diligent bee. To get a Black bee, combine a White bee and a Diligent Bee. 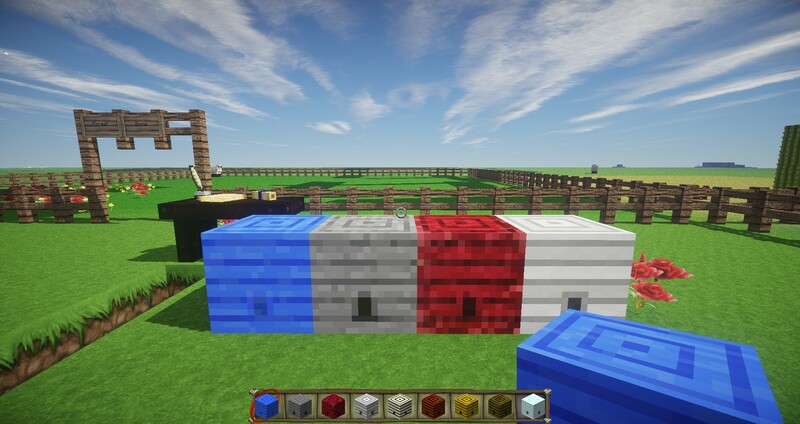 To get a Purple bee, combine Red and Blue bees. To get Pink bees, combine Red and white bees. To get Green bees, combine Yellow and Blue bees. To get Cyan bees, combine Green and Blue bees. To get Gray bees, combine White and Black bees. To get Light Gray bees, combine Gray and White bees. To get Magenta bees, combine Pink and Purple bees. To get Orange bees, combine Red and Yellow bees. To get Light Blue bees, combine Blue and White bees. All these bees produce their corresponding color combs. Read Carefully: Mixing naturally occuring bees may give you something even more common. Crossing something common with naturally occuring bees might cultivate it. Cultivated bees can branch off into at least three different directions. Sinister bees are cultivated but also modest.Jungle climes also seem hellish. Heroes lurk in dungeons and have found refuge in forests. The frugal and austere like it hot.Beware dragon. Rural are diligent and plain. Now for the tree breeding!Tree breeding requires at least 1 queen (Rural Works the best)in an apiary near by.Once you have at least 2 trees of different types around the apiary, you should eventually see a different colored leaf block. There is a chance a sapling will drop. Analyze it with a Treealyzer. DO NOT READ unless you don't want the next version of forestry to be spoiled. Plant Oak and Birch saplings near each other with an apiary with bees nearby and there is a chance it will breed into a Silver Lime tree. If you plant Oak and Spruce Trees near each other, there is a chance it will breed into a Mundane Larch Tree. If you plant Silver Lime Trees and Apple Oak, there is a chance it will breed into a Hill Cherry Tree. If you plant Hill Cherry Trees and Silver Lime Trees near each other, there is a chance it will breed into a Common Walnut Tree L7. If you plant Common Walnut Trees and Hill Cherry Trees near each other, there is a chance it will breed into a Sweet Chestnut Tree L7. If you plant Mundane Larch Trees and Red Spruce Trees near each other, there is a chance it will breed into a Bull Pine Tree L7. If you plant Bull Pine Trees and Mundane Larch Trees near each other, there is a chance i will breed into a Sequoia Tree L7. If you plant Jungle Trees and Silver Lime Trees near each other, there is a chance it will breed into a Teak Tree L7. If you plant Jungle Trees and Teak Trees near each other, there is a chance it will breed into a Kapok Tree L7. If you plant Kapok Trees and Teak Trees near each other, there is a chance it will breed into a Myrtle Ebony Tree L7. If you plant Kapok Trees and Myrtle Ebony Trees near each other, there is a chance it will breed into a Yellow Meranti Tree L7. Benitos Lair made a video and included the guide! Any distribution of the guide in other forms than a link needs to be clarified with me. All of this was found legit so any combinations you submit must be legit and you must have been found out by yourself. After you have clarified distribution, you must include a link to this page. If you have learned any combinations for the Extra Bees add-on for forestry, tell me (assuming I haven't found it out) in the replies below and I will add it to the guide and you will get full credit Update: Forestry Has updated with tree breeding! Go check it out, It also means extra bees portion of the guide will be updated again. Thanks, I was up late last night finishing it. that helps a lot... but not exactly what I was searching for... however got +1 for you!!! Vindictive branch will never be released. Better just to remove it from the guide. Then why is it in the genome imprinter? Excellent, many thanks for you hard work. While this is perfect for unlocking the breeds, I'm not sure if this is what I'm looking for. Question in spoilers so I don't auto spoil anything. All of the endenic branch have silky combs? I'm trying hard to make neumerous full sets of apiarists armour and bags. Is there an easier way pre-austare, to make them work faster/live longer? Currently I'm trying to breed in my single valient drone drop into tropical. Yes, all of the Endenic Branch does produce silky combs. I am not sure but I do know the Exotic and Endenic have very long lifespans. Could you please explain what those effects do? ETA: If I try to get a Sinister Bee, the Apiary gives the error that it is night time, and it's not nocturnal. Any Help? I made a mistake, it is a Modest Princess and a Cultivated Drone and Sinister Drones have an Aggressive affect which hurts you. Now I get, Sky Obstructed! Any help?? Go to a different part of the nether, search around and an ideal place. Are you close to the top of the nether because if you are, it will give you that error. So far.... with basic bees (not even common) I've got Tropicals with long life and no poison (from the rare Valiants) still working on nocturnal. Planning to breed in the higher drone count from Modest next. I'm holding off on type breeding until I've got a full set of beekeepers clobber (those austare bees scare me just reading about them....... first thing I'm gonna do is breed out that darn effect ). If anyone needs any help with bees, you've come to the right place to post your questions. I've bred the sinister queen without the nocturnal trait, so it needs hellish climate and a daytime. Did I fail, or it can be bred somehow? In the beealyzer on the second page next to temperature tolerance, does it have say down1, up1, Both1, or nothing. "None". Only -2 in "inactive" breed. Its the Sinister-Noble crossbreed. Have any of you seen the Extra Bees mod? 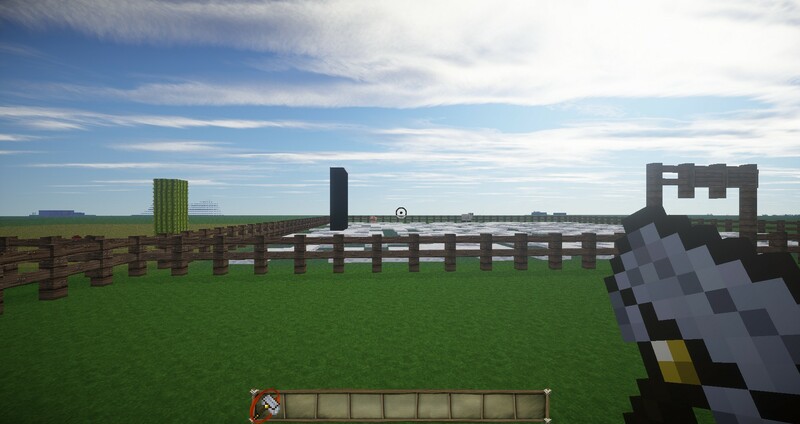 (Link: http://www.minecraft...ts-and-liquids/) I recently installed it, but I've been having some troubles getting all the new species of bees. Do any of you have a guide, or maybe could help? Yes I have and and am a little stumped too. I don't have a guide quite yet. I'd love to help. You might have to redo the bee again because sometimes that will happen. Also, submit the combinations you've learned for the Extra Bees mod and the Vis bees mod and I will add them to the guide and give you full credit for that combination(s).